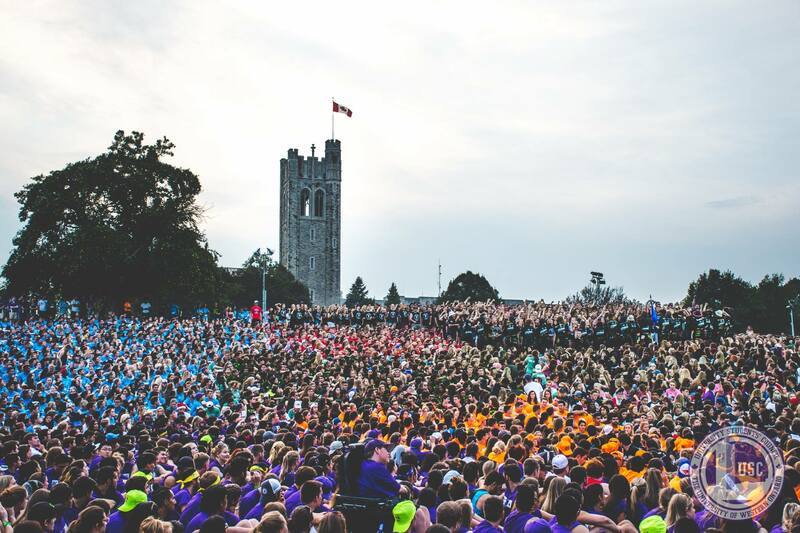 Sophs are unique to Western University and play an integral role in the development of passion and school pride in each first-year student. Sophs volunteer to dedicate a year to living on a floor in residence to mentor students. My best analogy is to think of an RA or Don like a parent (aka they make the rules), but a soph is like an older sibling—arguably more fun but still has your best interests at heart. This year, I had the unreal experience of sophing in Medway-Sydenham Hall. Regardless of your building, here’s a nostalgic glance back at 10 moments that make this volunteer opportunity so memorable. 1. Learning names = a personal hell. The struggle never ends. It begins with desperately trying to learn your team’s names at the beginning, scrambling to remember everyone’s soph names over the summer and then struggling not to name-drop everyone during Orientation Week. Oh, and learning all of your frosh’s names during September definitely took more memorization skills than any of my finals! 2. Acting like being called your birth name is a terrible offense. Whenever my frosh tried to call me by my real name I felt either confused or personally offended. Sophs take their new identities very seriously. Either your frosh didn’t recognize you all cleaned up, looked at you differently after hearing your story or had a good chuckle at your expense. Hilarious? Always. Embarrassing? Depends how much pride you have. 4. Being a proud parent. There’s no better feeling than one of your frosh doing something incredible and getting to yell “THAT’S MY FROSH!!!!!! !” Every soph takes great pleasure in being obnoxiously proud of their frosh. It’s just a thing. I’ll never forget the first time a frosh asked me for genuine, serious support. Equally close to my heart are the times I had to reach out to them for help. As a soph, you never expect to do so, but you get so close to your frosh that they can tell when somethings up. It just wouldn’t be right not to share what you're going through with them. You are as much a part of their life as they are yours. 6. Fitting 20 people into a tiny room to do nothing and it not being weird. I can’t count how many times a bunch of frosh just congregate in your room and it’s a massive chill fest. This usually leads to staying up way too late for no good reason. Life chats are essential to the residence experience and there’s certainly never a shortage of them. Yes, you end up exhausted in the morning and need multiple naps the next day, but honestly, you’re always ready to stay up again in a heartbeat. Helping your frosh apply to soph is so bittersweet! You want to soph forever but reality has other plans. Welcoming the new team to the building is so sad but so necessary. Plus, you get to be super proud of your frosh who got a position! Leaving your mark in your room by carving a desk, signing a wall—just generally defacing it in some way to leave one final impact on the building. In Med-Syd, sophs carve their names into the front of the desk beside the names of those who have come before them. Because the same rooms are sophs rooms each year, you can trace back the lineage of those who came before you, which is pretty neat. For me, this includes obsessively looking through my camera roll and Snapchat memories to relive the best moments. I also really miss wearing a fanny pack—what they lack in style, they make up for with convenience. I know I’m not alone in this. Although moving out is sad, walking out of residence knowing you’re leaving with way more friends than you arrived with softens the blow. Actually, scratch that—you’re leaving with a new family. As a floor, you go through thick and thin in tight quarters. Yes, initially the bond is forced, but before you know it you’re heading to the caf with these people out of choice, not just because you’re scared of eating alone. If you ask any soph about their experience, I guarantee you they will say it was challenging, but beyond rewarding. These memories are but a few of the vast amount sophs hold close to their hearts in addition to all the unique quirks of each building, floor and frosh. I’ll be forever grateful for the opportunity.